It's already been more than two weeks since a yet-unexplained explosion at BP's Deepwater Horizon offshore drilling rig started sending between 5,000 and 25,000 barrels of oil each day into the Gulf of Mexico. The spill is expected to completely trump the Exxon Valdez disaster, taking the title of worst oil catastrophe in history. 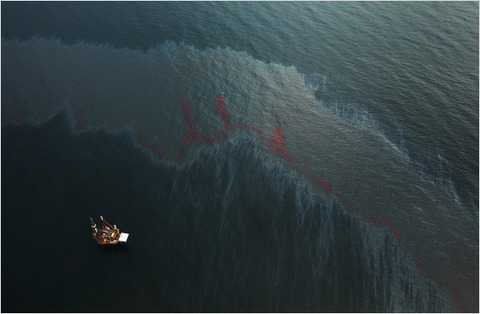 Each day more oil is washing up on the shores of gulf states, as over 2,500 square miles in the gulf are completely blanketed with petroleum. The fishing industry and tourism industry are suffering tremendously and will continue to suffer through the foreseeable future, to say nothing of the havoc that the spill is wreaking on the already fragile ecosystems in the gulf. Instead of looking at the oil spill rationally, objectively, and apolitically, pundits and politicians are already playing the blame game and trying to mold their messaging strategies around the disaster, with oil drilling advocates preempting environmentalists and clean energy advocates by undermining their response. "I would not be surprised if the White House said, you know, we might be able to, guess what, do what? Use this crisis to our advantage. Let this crisis get really bad, and then we will step in," Brown told Neil Cavuto. "We will be able to shut down offshore drilling. We will be able to turn to all these alternate fuels." Unsurprisingly, radio host Rush Limbaugh has suggested that the explosion was the result of eco-terrorists tampering on the rig as an Earth Day stunt. He also pointed out (thanks to his boundless knowledge of marine ecosystems), "The ocean will take care of this on its own if it was left alone and left out there. It's natural. It's as natural as the ocean water is." And while environmentalists and progressives have begun using the crisis as a basis for an emboldened messaging campaign on clean energy, climate change mitigation, and fossil fuel reduction, the political debate on the climate/energy bill may actually end up being harmed by the spill. The Kerry-Graham-Lieberman climate bill, which was never released because of Graham's anger about Reid's desire to take on immigration reform, has been in limbo since before Earth Day, and the oil spill, while a prime talking point for climate bill advocates, could actually further delay cooperation on the bill. Democrats are using the oil spill has a hot campaign issue and fund-raising appeal in Congressional races, and at least two Democratic Senators, Bill Nelson (D-FL) and Bob Mendendez (D-NJ) have used the crisis as justification to pull their support for the climate bill because of its offshore drilling provisions. In the short run, this may seem a wise strategy: point out to the American people that the disasters created by the oil industry (not to mention the lives recently lost in the even-dirtier coal industry) are destroying our environment, harming other industries, and keeping us addicted to fuel that we mostly buy from countries that don't like us. And while it's true that a huge part of climate change mitigation must be to cease our addiction to oil, not expand it, this political expediency could instead hurt the ultimate chances of necessary bipartisan support on legislation. If progressive Democrats begin to walk away from the bill because of its oil provisions, why would fence-sitting Republicans have any more incentive to work with Democrats to pass the bill? It is the Republicans who have been fighting tooth and nail for further nuclear and drilling provisions, and they would much rather see no climate bill passed at all than one passed with no drilling expansion provisions. So while using the oil spill to increase public awareness of the potential harm of the oil industry and the need for United States energy policy to move in a completely new direction, politicizing the disaster could end up making the chances of putting a price on carbon even more slim in the 111th Congress, likely the last Congress in decades that will see the opportunity to get something done on this front.